The following tips and pointers have been compiled to make your initial foray into the jam making process as easy as possible, especially when things don't quite go according to plan. When using fruit that has a tough skin, it is a good idea to simmer it first, to soften the outside, before any sugar is added. If you are using soft fruits for jam making, such as strawberries, you will find that the fruit will virtually disintegrate when simmering in the pan. Therefore, by mixing this type of fruit with the sugar and a little lemon juice overnight, the natural juices will soak into the sugar and create stronger, more solid fruit, which will be more likely to remain in whole pieces within the finished preserve. Before you boil your mixture, it is essential that all of the sugar crystals have been completely dissolved, so that the jam will be able to set correctly and not remain runny. Stir well and if you are unsure whether any sugar crystals remain, then dip a large wooden spoon into the mixture, remove it and let the majority of the fruit liquid drip off before seeing if any crystals are visible. When first making jam, it is sensible not to be over ambitious, and certainly not start off by making enormous quantities. Instead, it is much easier and more sensible to stick with the quantities on recipes, rather than doubling up - or more. It is difficult to boil larger mixtures quickly and therefore the resultant jam may not set as well as smaller amounts, which are easier to mix, boil and monitor throughout the process. If you are using a specially designed jam thermometer, you should aim for your preserve to reach a temperature of 104°C / 220°F (known as the 'setting point') and no more, as it may begin to burn at higher temperatures. To test whether your boiling jam mixture is ready to be poured into the jars to set, place several small saucers into a freezer for a few minutes, so that they are extremely cold. Take a spoonful of the jam and place onto the centre of one of the chilled saucers and leave for just 60 seconds or thereabouts. Then, using your finger, test the surface to see if a skin has formed, with 'wrinkles' being an indication that your jam is ready to set. Repeat this test as necessary, at five minute intervals, and continue simmering the jam until a skin forms in this way. During the boiling process, a natural scum will most likely appear on the mixture. Do not skim this off, as you will be removing valuable mixture. Instead, when the jam has reached setting point and has been removed from the heat, stir in a small piece of butter, which will help the scum dissolve back into the mixture and effectively vanish completely. Once your mixture has started to set, allow it to cool down for between ten and 15 minutes before pouring / spooning into the sterilised jars. 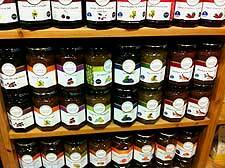 This is particularly important for jams containing chunky pieces of fruit, since it will prevent the fruit pieces from all settling at the bottom of the jar or floating to the top. When labelling your jars, make sure that the glass is completely dry and cold to the touch, so that the glue will stick properly and the label won't peel off at a later date. When storing your jars of jam, choose a cool and dry spot, in the dark and away from sunlight. When making jam with fruits that have low acidity levels, you can add a little lemon juice to increase the overall acid content. When experiencing setting problems, simply return your jam mixture to your saucepan and continue simmering / boiling, adding in some freshly squeezed lemon juice. 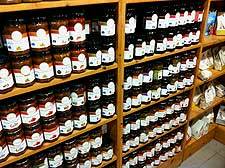 If you find that the top of your jam mixture has gone mouldy in the jar (after a few months), then you simply need to scrape off the first 1 cm layer or so, until all traces of the mould have been removed. The jam beneath will be completely untouched and fine to eat. If your mixture tastes 'fizzy', it should be discarded, as it will have started to ferment. 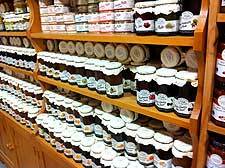 Once you have started to eat your jam, place the jar in a fridge until all of the preserve has been eaten, leaving it for no longer than two to four weeks.